Halima Turkish Van Cattery - Home Member of the TICA Turkish Van Breed Committee past Breed Chair. This painting was done by one of our talented kitten owners of her three wonderful sisters she got from Halima cattery: Cleo, Ariel, and Cassie. copyright Joanne Danford-Cordingley 2015 Pictured below is CFA Best OF Beed Turkish Van in the world for 2014-2015 show season Gumibar was also 23 best Allbreed Cat in CFA he is now a Regional Winner in both TICA and CFA. Halima is a CFA and TICA registered cattery located in Michigan specializing in Turkish Van kittens for show, breeder, and pets. We have been Showing Turkish Vans for 16 years and breeding quality kittens for 15 years and have imported cats from around the world to ensure low inbreeding and healthy stock. We are striving to produce great examples of the Turkish Van to preseve this rare natural cat. Our kittens are raised underfoot in our home and handled from birth to ensure they are strongly bonded with humans. Once you experience a Van from Halima Turkish Vans you will realize what it was your home was lacking. We have a limited number of litters per year allowing us to hand raise each and every kitten. We have bred shown and sold many award winning cats and started breeders selling only the top stock available allowing them to start breeding award winning cats right from the start. Why not start with the best.Turkish Vans come from the Lake Van area of Turkey and are a very old breed one could argue the oldest natural breed of cat. They have a medium length coat that is very silky and are medium in build but very muscualr.They are chalk white with colored markings on the head and tail. New to the United States is the all white Turkish Vans or Vankedisi prized in the Lake Van Region of Turkey.They are an energetic cat and bond strongly with their family. They are very smart and are easily taught tricks. This statue of the Van Kedi is located in Van Turkey. Halima Temple Anubis Halima cattery's 2011-2012 Show alter finishes his TICA show season as a Supreme Grand Champion Alter and Regional Winner. Anubis became a CFA Grand Premier at the Taylor Michigan cat show. Member of the TICA Turkish Van Breed Committee past Breed Chair. 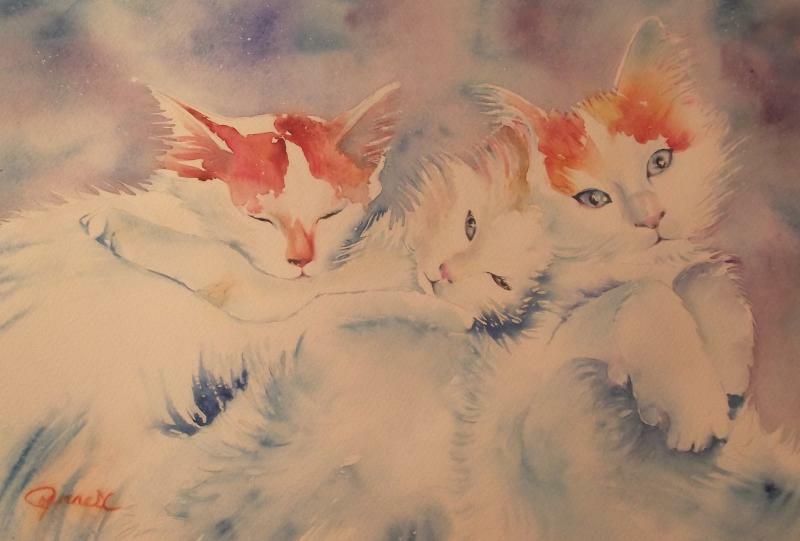 This painting was done by one of our talented kitten owners of her three wonderful sisters she got from Halima cattery: Cleo, Ariel, and Cassie. Pictured below is CFA Best OF Beed Turkish Van in the world for 2014-2015 show season Gumibar was also 23 best Allbreed Cat in CFA he is now a Regional Winner in both TICA and CFA. Halima is a CFA and TICA registered cattery located in Michigan specializing in Turkish Van kittens for show, breeder, and pets. We have been Showing Turkish Vans for 16 years and breeding quality kittens for 15 years and have imported cats from around the world to ensure low inbreeding and healthy stock. 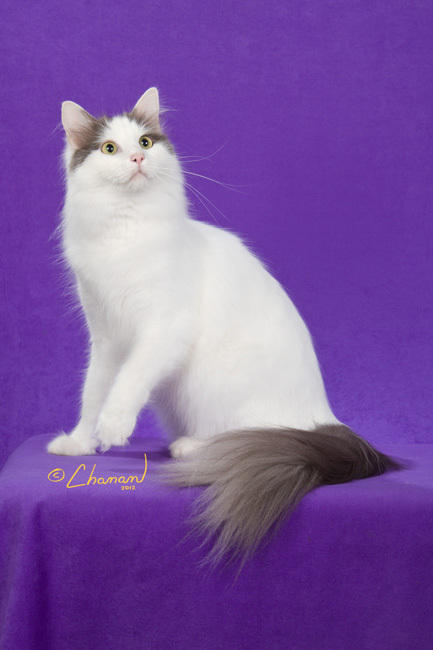 We are striving to produce great examples of the Turkish Van to preseve this rare natural cat. Our kittens are raised underfoot in our home and handled from birth to ensure they are strongly bonded with humans. Once you experience a Van from Halima Turkish Vans you will realize what it was your home was lacking. We have a limited number of litters per year allowing us to hand raise each and every kitten. We have bred shown and sold many award winning cats and started breeders selling only the top stock available allowing them to start breeding award winning cats right from the start. Why not start with the best. Turkish Vans come from the Lake Van area of Turkey and are a very old breed one could argue the oldest natural breed of cat. They have a medium length coat that is very silky and are medium in build but very muscualr.They are chalk white with colored markings on the head and tail. New to the United States is the all white Turkish Vans or Vankedisi prized in the Lake Van Region of Turkey. They are an energetic cat and bond strongly with their family. They are very smart and are easily taught tricks. 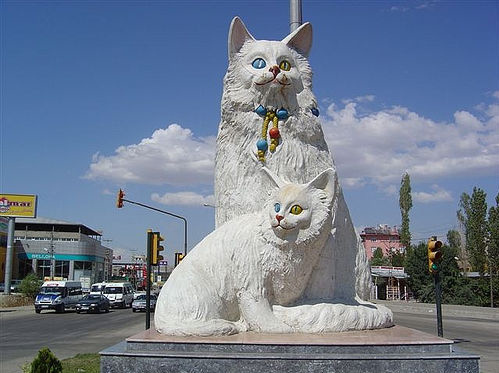 This statue of the Van Kedi is located in Van Turkey. Halima Temple Anubis Halima cattery's 2011-2012 Show alter finishes his TICA show season as a Supreme Grand Champion Alter and Regional Winner. Anubis became a CFA Grand Premier at the Taylor Michigan cat show. Halima is a CFA and TICA registered cattery located in Michigan specializing in Turkish Van kittens for show, breeder, and pets. We have a limited number of litters per year allowing us to hand raise each and every kitten. Turkish Vans come from the Lake Van area of Turkey and are a very old breed. They have a medium length coat that is very silky and are medium in build but very muscualr.They are chalk white with colored markings on the head and tail. New to the United States is the all white Turkish Vans or Vankedisi prized in their country check our white odd eyed girl out in our links.